If you only knew two words in a foreign language, what would they be? In Spanish, I've really only known cerveza and baño, because to me they pair together crucially. One day recently, two boys on the beach on the island of Olo‘ua gave Karen and I some greater perspective on language. The medical team was ashore at a village clinic when Karen and I spotted the boys playing near hammocks hanging in the palm trees. The hammocks looked inviting, so off we went toward the trees. When we got to shore we engaged with the boys, played, and took a few pictures of them before they took off toward an old shack nearby. We said "bye!" and waved big. About halfway to the shack they turned and yelled back,“Love You”, and nothing more. Turns out they were going back home to get two worn out children’s books written in English. When they returned with the books, we sat on the hammock and read to them, and quickly realized that they did not know English at all. We both were a bit taken aback, realizing those were the only two words they knew in our language. Nice! We tried the phrase out ourselves the day after when we were back in the town of Neiafu, where there is always a group of young kids swimming off the dock at dusk. As we passed by in the dingy we greeted them with a loud “love you”! We heard a whole chorus of young voices yell back the same. Not the worst choice of words if you only are going to learn a couple. They won't get you a beer, but no doubt the true yield is far greater. Rotation 1, in the Va’vau group of Tonga was absolutely splendid. Despite being pinned down in the harbor of Neiafu for the first three days due to three low pressure systems (one of which formed into a cyclone), we managed to operate clinics in every remote village in the group. The team we had was absolutely fantastic, dedicated, and worked tirelessly. We had a couple from the UK- Hanna, a medical student, and her fiancé James, in aviation logistics; Ika the Medical Officer from the Ministry of Health; Alyani, a Nurse Practitioner from the Ministry of Health; Brian and Sandy, two NZ doctors, married, who not only shared service in their local clinic, but also came with us to all of the villages we visited. It was an awesome team! We saw over 200 villagers, and left no one behind who desired to be seen. I realized the value of how the team functioned together when I was trying to keep us on a daylight transit schedule. It was late afternoon and all the team was aboard, except for Ika. I returned and waited on the village dock as Ika dressed and bandaged a very badly infected finger. “Malo aupito”, (thank you very much) the injured man said as we departed. I wish I had the courage to say what the children had taught me, that underneath those two words are two others worth learning, worth saying… “Love You”! Because this is why we help. Karen and I are off now for the Haap’ai group of islands to the south. We have two rotations scheduled there before heading off for Fiji. For more pictures, visit our Facebook album by clicking here! For more information on our cause, visit www.seamercy.org. The Catamaran has now traveled from Carolina Beach, NC, to Tonga- to become a FHCC (Floating Health Care Clinic) for Sea Mercy - and we've completed our first three rotations. Sea Mercy's vision is to be the most effective preventive, curative, promotional and rehabilitative floating health care provider and service delivery mechanism to support the remote citizens of the island nations. Their mission is therefore to ensure that the community sector has the practical tools and talent available to accomplish those visionary ends. To accomplish this in the short term they will provide floating health clinics to needy populations. To effect long term community improvement, they work to increase awareness of the health issues facing these vulnerable populations. We are happy to be back in Tonga! To bring you up to date…. 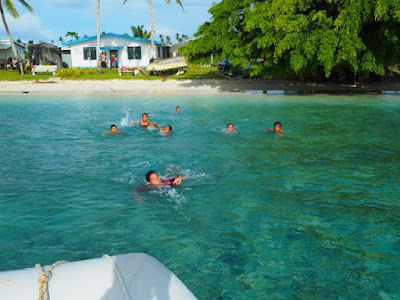 It has been now four months since we left Sea Angel in Neifu Va’vau, Tonga on our way back to America. Karen flew a direct flight back, or as direct as possible from here, Nukalofa, Fiji, LA, Charlotte, Wilmington, which took her a mere three days. My dear friend Mike Bartz flew out to Neifu and helped with the last rotation, preparing the boat for the summer cyclone season, then we enjoyed a 10 day road trip together through New Zealand before flying back for Thanksgiving. One thing that struck both Karen and I was how different it felt to be back home after having spent so long in the South Pacific Islands. Both of us felt a kind of “shock” in our returning home to the “land of plenty”. Being back in Tonga is very pleasantly simple. We spent a long 10 days with the boat in the yard taking care of maintenance, putting it back together again, and cleaning. We had the pleasure of staying in a wonderful little cottage on the water during this time so we could relax a bit in the evenings. We are now back in the harbor at Neifu and have our first volunteers (Hanna, James, and Sam) aboard for rotation 1. Unfortunately, Tonga has been under a late season cyclone alert and the weather has been downright miserable! Today seems to have been the worst of it, with the strong winds that have backed around from the typical SE to the N, then West, squally, rainy, and with large confused seas. A second low has developed into a cyclone, now classed as a category 3 which is currently approaching Fiji. It is projected to weaken substantially before passing over us but it is keeping me anxious. We have been staying put in the main harbor with the volunteers helping out at the main hospital in the mornings. Needless to say we are all getting a bit of cabin fever, and all of us want to get out to the villages! We will keep you posted.